Eric (Jade Calegory) ponders his grim fate. Oh, you thought sending a kid in a wheelchair careening off a giant cliff was bad enough? 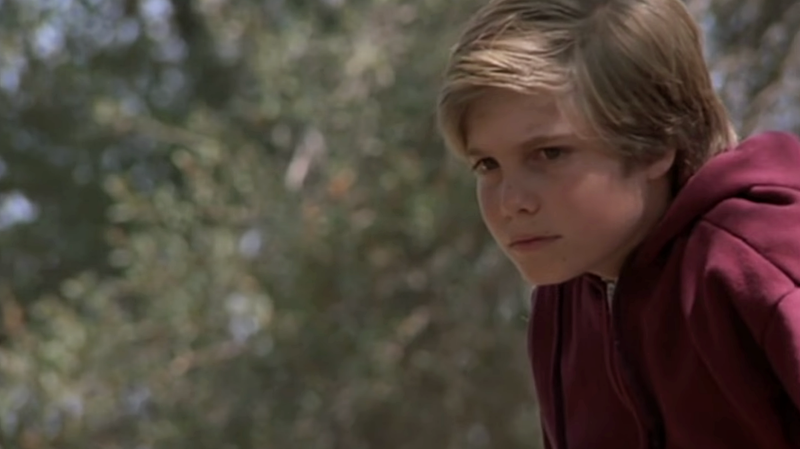 A new clip has surfaced from the iconically bad ‘80s film, Mac and Me, and let’s just say child murder was apparently not off the table for this family-friendly fare. Mac and Me, about a boggled-eyed creepy alien doll thing (a Mysterious Alien Creature, aka MAC) who befriends a boy named Eric Cruise (Jade Calegory), has become legendary for being one of the worst films of the 1980s, and possibly ever. Its cult status has endured thanks to stunts like Ant-Man’s Paul Rudd trolling Conan O’Brien by repeatedly showing the “wheelchair off a cliff” scene instead of footage from his upcoming projects. By now, that scene has burned itself into our brains. But there’s one that’s far, far worse. Fantastic Fest film curator Peter Kuplowsky has shared on Twitter what he says is a largely unknown clip from the Japanese version of 1988's Mac and Me, cut from the US release. Other tweets from people who’ve seen the Japanese version confirm his account. During the climax of the actual film, Eric has reunited MAC with his family and is trying to get them to safety. They accidentally alert security, resulting in a big shootout where Eric is caught near an explosion and killed. According to the clip Kuplowsky’s shared, that wasn’t what originally happened. In another version of the film, Eric is freaking shot point-blank in the chest and dies, slumped over his wheelchair like Jesus after the crucifixion. I can’t do it justice. You simply have to watch. It’s pretty tame, but a content warning all the same. It is a kid getting shot. Luckily, Eric is saved by MAC and his family after his death in the theatrical version, so I’m hoping he’s revived in this one too, though no one in the tweet conversation has specified that was the case. I mean, you can’t end Mac and Me on child murder, can you? Well, apparently in the United States you can’t start it with that either, as this scene isn’t in any of the US versions of the film. It’s unclear whether the scene was cut because the producers knew it was a bad call, or if the MPAA insisted it be changed to avoid a rating above PG. But thanks to Kuplowsky’s promotion of this clip from Japanese cut, it looks like this cult classic (which celebrates its 30th anniversary next week) will go down as an even more bizarre piece of cinema than it already was.